Window Tinting, Rims and Tires, and More! Offering everything from car audio to window tinting, Auto Addictions is here to help you take your driving experience from mundane to magical. We specialize in mobile electronics installation, and we also offer custom rims and tires. So whether you want a car DVD player or a car alarm, we're the professionals for the job! Wishing your car stereo system sounded better? Want custom rims and tires or window tint to help your car stand out? Ready to upgrade to the convenience and security of a car GPS system? No matter why you're considering aftermarket customization and mobile electronics for your vehicle, Auto Addictions can help. We're here to help you transform your ride, inside and out. Specializing in all aspects of car electronics--from car DVD players to car audio to car alarms--we're also proud to offer window tinting, custom rims and tires, and so much more. Get the driving experience of your dreams with help from Auto Addictions of Pittsburgh! At Auto Addictions, customer service is our number one priority. We go the extra mile to ensure we take great care of you as well as your car, truck, or boat. That includes offering competitive pricing and free estimates as well as incredible lifetime installation warranties. And unlike any other car audio shop in Pittsburgh, Auto Addictions is open 7 days a week for your convenience! Let our professionals take the hassle, stress, and uncertainty out of vehicle customization. We're ready to make the entire experience of getting a car alarm, car stereo, or car GPS installed simple and straightforward: call now to learn more. 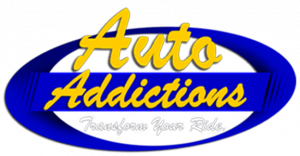 Auto Addictions is conveniently located in Pittsburgh. Closely located to the towns and areas of Bethel Park, McCandless Township, South Park Township, Monroeville, West Mifflin, Mckeesport, Baldwin, Upper St. Clair, and Brookline, we provide top-quality mobile electronics and car customization services to customers throughout the area. Established by Mark Lucas, a car audio video pro with nearly a decade in the business, Auto Addictions is a local, family-owned mobile electronics shop. We're dedicated to making certain our area friends and neighbors get the superior car electronics and customization services you deserve, so if you're dreaming of enhancing your ride, we're here to help. From vehicle security to car audio video, window tint to marine electronics, we have you covered! For your protection and quality assurance, Auto Addictions is fully insured.